Weighty Matters: Parental "No" Files: Public Libraries Push Junk Food on Preschoolers Now? Parental "No" Files: Public Libraries Push Junk Food on Preschoolers Now? 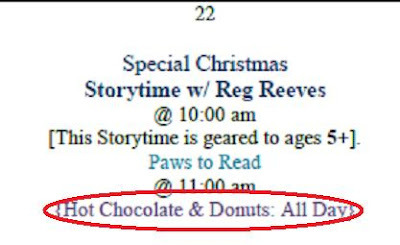 The next in the never ending line of insane examples of entirely unnecessary junk food provision to children comes from a fellow health blogger's local library in Ketchum, Idaho. It's called The Children's Library and their in-library events are clearly geared at pre-school and elementary school aged kids. Looking at their December schedule, of the 24 days they're open, 7 of them involve giving kids food. Junky food. Pancakes, holiday cookies, 2 days of gingerbread houses, hot chocolate, popcorn and drinks, and of course, "hot chocolate and donuts all day" - because what screams out reading more than donuts? Since when was food even allowed in libraries, and more importantly, why would libraries feel the need to ply children with junk food in the first place? Aren't libraries places to go to cultivate a love of reading? Of learning? Aren't there plenty of other opportunities to cultivate a child's love of donuts? So parents in Idaho (and perhaps elsewhere too), add children's libraries to your list of places where you're going to need to say, "No" at when your child is offered junk food that you yourself hadn't planned on giving them.